How to write a fantasy series is not as simple a question as it may at first seem. Writing a fantasy series can be as hard as writing only one book. For myself, first I have to figure out a plot that has legs… so to say! This means something that will transcend throughout the series, regardless of how many books that could end up being. I have to be honest and say I like loads of engaging characters. I enjoy the diversity of their personalities that I write and how they relate to the overall fantasy series plot. What they will do to advance the ultimate resolution. Will they add to the solution or just add another complexity to the stories? 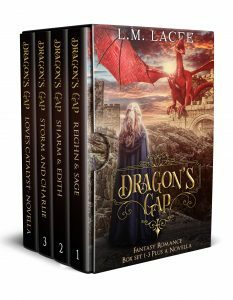 In my epic fantasy series Dragon’s Gap, I decided each book would tell a new tale of romance and adventure but not be restricted to just two individuals. It was fun to write about so many different types of people in an imaginary town who were just so very interesting.